This is a Photogenic 45" Umbrella with Removable Black Cover. This size is suitable for a two - three person head and shoulders portrait. Umbrellas soften, broaden, and diminish the light output of any tungsten or flash light source. Umbrellas with a white interior soften and weaken light more than an umbrella with a silver lining. 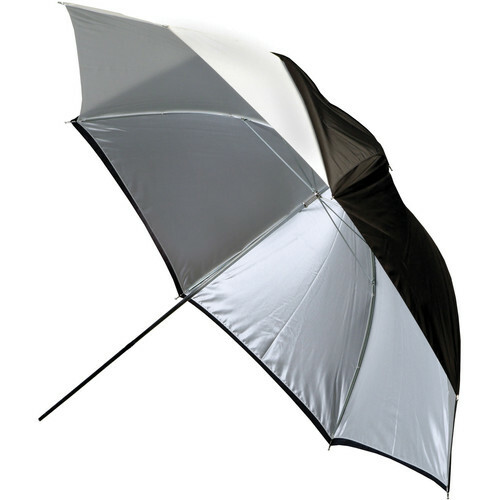 A white umbrella without a black backing may also be used as a makeshift softbox, although the use of the light will not be as efficient as with a lightbox. Box Dimensions (LxWxH) 28.8 x 5.05 x 2.2"
Umbrella, White - 45" with Removable Black Cover is rated 4.3 out of 5 by 22. Rated 4 out of 5 by Eljea from Great balance between value and function I will use this umbrella on location and in the studio. This umbrella is very well suited for my portable lighting system that uses up to 4 SB-600's mounted on a custom bracket and its larger size evenly lights a group of 5-6 subjects. Shooting through it produces soft and even light distribution for a head and shoulder portrait, but it will decrease light sharply by 2 or 3 stops making it suitable for only one subject. Its construction is very good with a sturdy frame and a moderately heavy fabric for an umbrella. I would like to have seen a cover provided by the manufacturer to make it better for portable use. Rated 5 out of 5 by NW NJ Wedding Photographer from Fiberglass Rods make the difference I've owned other brands of umbrellas that had the metal rods, and they don't hold in any bit of wind. After taking a few falls at weddings, they became bent out of shape, and I decided it was time to get something more reasonably priced yet with solid build quality. These were just what I needed! Rated 4 out of 5 by Charles from Great shoot thru or reflector umbrella I like the Photogenic 45 white umbrella. The inside is silver, even though it is listed as a white umbrella. It reflects a lot of light when used as a reflector umbrella. Even though it is silver inside you can still shoot thru it, but you will lose 2-3 stops of light when used that way. The umbrella has a black removable cover. My only beef is the cheap clear plastic case it came in. The first time I tried to put the umbrella back in the case the whole thing fell apart. The top flap ripped off & the bottom end tore right thru. It is not a big deal. I like the umbrella itself a lot, but still they could have used better or thicker material & given you something usefull to keep it clean. I still recommend it because it can be used as a good reflector umbrella or a shoot thru umbrella but the case is next to useless. You will need to fix it with tape the first time you use it. Rated 3 out of 5 by 3VEES from Big Brella This is a large umbrella. I shoot videography and wanted to use this with my Lowel Omni lights. However, the umbrella is too large for these lights. The silver is different than other silver umbrellas, seems like a matte flimsy finish. Removing the black cover is awkward and cumbersome. Rated 5 out of 5 by abe402 from My first umbrella The inside is a white silver finish and the black backing comes off easily. This is my first umbrella and I do not have extensive knowledge on all the different umbrellas but I can say that I like this one. It is not too big and definitely not small. Excellent product. Rated 4 out of 5 by wisertime from Good umbrella I bought this to replace a white umbrella I broke. Its sturdy and does the job. I thought the ad was confusing and I was told it was white, but is actually silver inside, but thats ok, because I like it. I have not tried it as a shoot thought yet. Rated 4 out of 5 by Greengart from Soft shoot through I use this primarily as a shoot through umbrella with my sb-800 and am very pleased with it. it is cheap and works well. be aware that in reality it is somewhere between a white and silver color even though the description says it is white. Rated 5 out of 5 by Kristina from Great umbrella for half the price! My other umbrellas were falling apart, so I saw this one listed for only $20, but was skeptical because of the low price. Well, it's definitely just as good as the ones that are $45...and I'm planning on ordering some more now. Is this Umbrella Heat Rated for 750W Constant Light Tungsten Lowel Type Heat generated by Quartz Bulbs? Does this umbrella have a solid shaft? How much is the diameter of the shaft? The shaft of the Eclipse umbrella is 1/4 . This is a good product. I own about 6 umbrellas in various sizes which I purchased from B &amp; H. I use them in studio and on location. Answered by: ED J L.